Born February 7, 1921 in Wilmington Delaware, son of the late Michael and Rosa (Cataldi) Fierro, Mr. Fierro graduated from Wilmington High School in 1939. He enlisted in 24 July 1943. He proudly served in World War II as part of the 39th Bomb Group on the B-29 Superfortress “Hell’s Belle”, dedicated to the City of Wilmington. 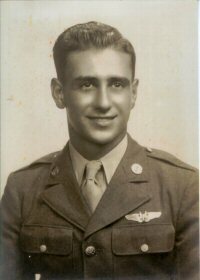 For a mission flown on April 30, 1945 he was awarded the Distinguished Flying Cross. In all, he flew over 425 combat hours in the Pacific Theater and was awarded 8 commendations including the Air Medal with 2 Oak Leaf Clusters. Albert had the unique distinction of having his crew's B-29 named after his home town - click here to read a transcription of the 1945 article. In 1946 Albert married Marie Ventresca Fierro. They have 2 daughters and 1 son and 5 grandchildren. After working in the family business since he was eight years old, Albert assumed ownership and operation of the Italian cheese business in 1946 and later formed M. Fierro and Sons, Inc. He was President of the firm until his retirement in January 2001. His love and dedication to the family business was well known and admired by all who knew him. 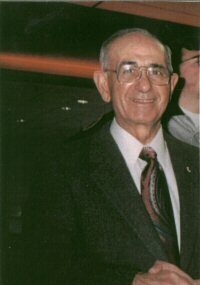 Mr. Fierro was devoted to the Knights of Columbus, volunteering his service since 1960. A 4th Degree member of the St. Pius X Council, he served in many positions particularly focused on The K Of C National Bowling Association where he served as a Director and was responsible for bringing six National Bowling Tournaments to the City of Wilmington. In 1985 he was inducted into the National Bowling Association Hall of Fame. Mr. Fierro was twice named Knight of the Year and received numerous awards for his 25 years of service to The Seminarian Fund. In 1987 he was awarded The Voluntary Service Award from the Veterans Administration and The Man of the Year Award from The Columbus Day Committee. He spent countless hours in support of The Little Sisters of the Poor, The Bayard House and The Serra Club. He was a lifelong member of St. Anthony of Padua Roman Catholic Church. A Mass of Christian Burial was celebrated at St. Anthony of Padua Church, on Wednesday, December 7 at 12:30pm. Entombment will follow at All Saints Cemetery.